Reading Champions Declared at 10th Emirates Airline Festival of Literature – Emirates Airline Festival of Literature. 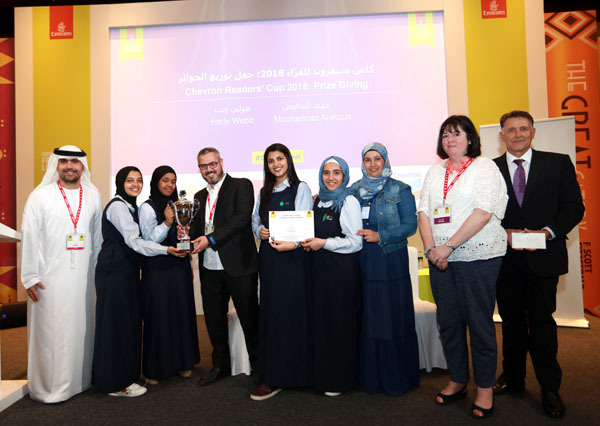 Dubai, 8 March 2018: Winners of the UAE’s annual book battle, the Chevron Readers’ Cup, were declared at the Emirates Airline Festival of Literature today. The reading quiz concluded its most successful year since its inception with almost 3000 students from schools across the GCC participating. 67 teams competed in the finals, which were held in Arabic and English in two age groups – Primary and Secondary. Teams answered questions from a list of books by Festival authors and the winners were awarded trophies, certificates and book vouchers. The 10th Emirates Airline Festival of Literature continues till 10 March with more sessions, panels and workshops for all age groups. Tickets can be purchased at the Festival website (tickets.emirateslitfest.com) or via the ELF Dubai app, available on the iOS and Google Play app stores and at Magrudy’s outlets around the UAE. Become a Foundation Friend loyalty member and enjoy benefits throughout the year, including priority booking and discounts on select Festival tickets, as well as exclusive discounts at several retail outlets in the UAE.